So when you hear ‘dust off your old exercise equipment,’ your mind probably goes right to the big pieces – the ones that gather a lot of dust. But let’s talk about the forgotten equipment. The stuff tucked away in the back of closets, shoved in boxes (since 1999), or stuffed on basement shelves. 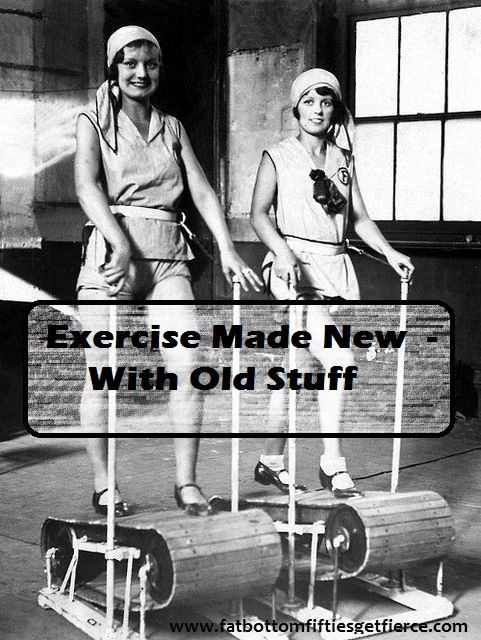 You know – the free weights, stability balls, kettelbells, stretch bands, pedometers, and those other exercise enhancers you once had to have. Pull them out and shake off the dust. It doesn’t matter that instructions and suggested exercise plans are long gone. Jump on the internet and find updated exercises using current technique and proper form. There are oodles to choose from. Bonus: many have free demonstration videos. And speaking of videos, who among us doesn’t have one stowed away in some forgotten place? We don’t have to have equipment to exercise – there are plenty of great ways to exercise without pulling anything out of the closet. But using equipment is fun. It changes things up. Having it out and ready to go can be motivating – just the visual reminder we need to keep moving while watching TV. Or instead of watching TV. And clothes count, too. Leotards, bike shorts, sports bras, T’s boasting motivational sayings, all get us in the mindset to move. Pull them out, shake them off, and put them on. Then get going. One caveat: make sure the equipment is safe to use currently. Stability balls should be properly inflated, weights the appropriate heft, etc. For instance, if using that old jump rope will result in various body parts causing injury to other body parts, you have my permission to add it to your give-away pile and move on to something less dangerous – like a pedometer. WHAT EXERCISE EQUIPMENT IS LURKING IN YOUR HOME, JUST WAITING FOR YOU TO INVITE IT OUT IN THE OPEN?